SHANGHAI, Sept. 14, 2018 /PRNewswire/ -- Phoenix Finance, a leading fintech company founded by influential media group Phoenix Satellite Television, has appointed Lendit co-founder Jason Jones as its Blockchain Global Strategic Advisor to enhance its blockchain strategy - a move that was first announced at last week's Lendit Fintech Conference in Shanghai. 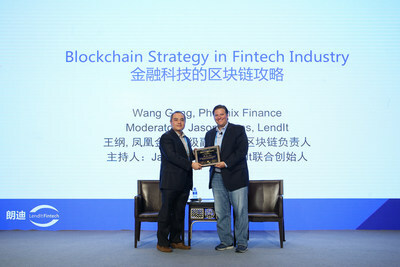 Wang Gang, SVP of Phoenix Finance and the head of blockchain business, presents a certificate of blockchain global strategic advisor to LendIt co-fouder Jason Jones. During a 30-minute interview conducted by Jones at the world's leading fintech event-Lendit Shanghai, SVP of Phoenix Finance and the head of blockchain business, Wang Gang, underlined the blockchain strategy that the company revealed in its Blockchain White Paper. In the White Paper, Phoenix Finance projected that the future growth of its signature business of wealth management, overseas products, mutual funds, insurance, and P2P will be driven by blockchain technology. "We find that blockchain has the potential to boost our productivity and slash costs, bringing competitive advantage to our business. That's why we're accelerating the development, and application of the latest blockchain technology," said Wang Gang. "Phoenix Finance and Lendit have been cooperating for years. Our alliance in developing blockchain takes our partnership one step further. "At this critical stage of development, Phoenix Finance desperately needs to pick the brains of globally-minded veterans like Jason Jones, who can dispense invaluable advice in every aspect of blockchain, including research, commercialization and globalization," Wang Gang said. "The sky is the limit for Phoenix Finance to apply blockchain technology in various commercial scenarios," said Jason Jones. "Built on the back of a global vision, a wealth of fintech experience, diversified business lines and over 8 million worldwide clients, Phoenix Finance's blockchain strategy is inches away from turning vision into reality." Phoenix Finance's Blockchain Research Institute will invite external experts and consultants to participate in building such an eco-system and turn its blockchain vision into reality. The company will also set up a platform to incubate a greater number of promising fintech projects with accelerative resources brought in by Lendit. The blockchain technology to apply with Phoenix Finance's products and relative financing scenarios see substantial progress. Phoenix Finance, which currently serves wealthy Chinese clients around the world, plans to launch new products that include embedded blockchain technology early next year. Offering a range of financial services that includes wealth management, mutual funds, insurance, global investment and P2P, Phoenix Finance has been at the forefront of technology application in China's fintech industry and is actively developing blockchain technology. Having accumulated 8 million registered users and RMB 80 billion worth of transactions through its investment platform over the past four years, Phoenix Finance is embracing blockchain technology to meet increasingly complex and diverse demands from its global clients, who are mostly middle and wealthy classes with investible assets between RMB 300,000 to RMB 10 million. According to Wang Gang, with the help of blockchain, each and every transaction becomes totally transparent and traceable during the whole process, giving clients an unparalleled investment experience, and cementing trust among participants �C an invaluable asset in the world of finance. In addition, blockchain will address the obstacles hampering the development of fintech in a fragmented market, such as information disparity, information delay and the high cost of due diligence. By working with various participants and partners across the fintech value chain, Phoenix Finance aims to build a safer and smarter financial ecosystem embedded with the latest blockchain technology. Phoenix Finance, founded by the Phoenix Satellite Television Holdings Limited, is a well-established one-stop-shop investment platform that aims to provide Chinese investors around the world with top-notch financial products and services. Partnering with top-tier financial institutions to source desirable investable assets globally and attaching great importance to the application of science and technology of big data, artificial intelligent, blockchain, Phoenix Finance is able to provide a broad range of wealth management products and customized advisory services that tailored to the needs of each individual investor. Currently, Phoenix Finance's product offerings include P2P, mutual funds, insurances, global investment, wealth management etc. Having accumulated 8 million registered users, Phoenix Finance is now a leading fintech platform in China.